We had a Whale of a good time. 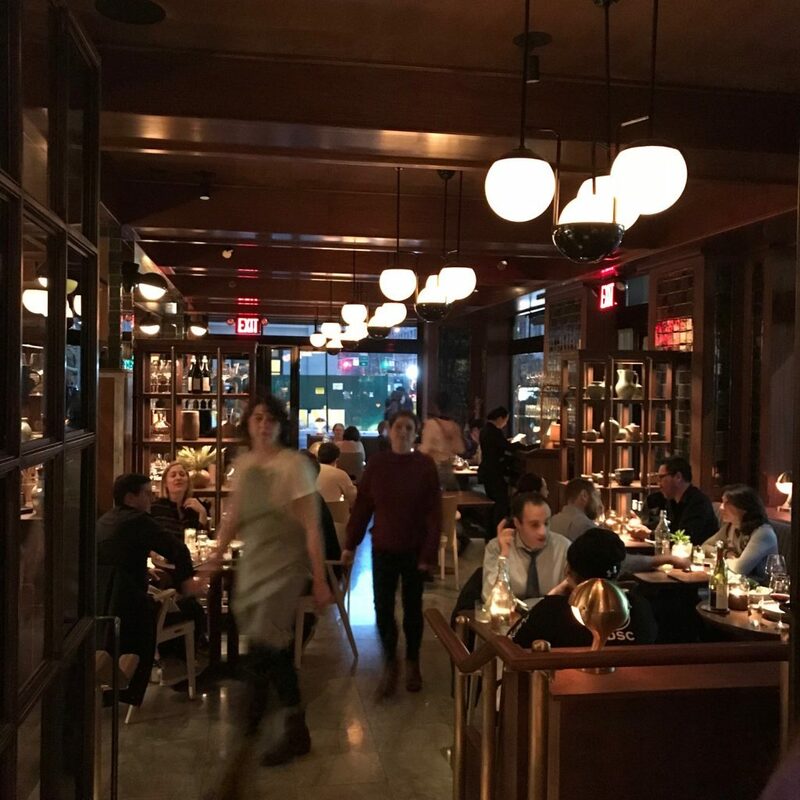 New kid on the block, Simon & the Whale, is a fabulous addition to the New York City dining scene. 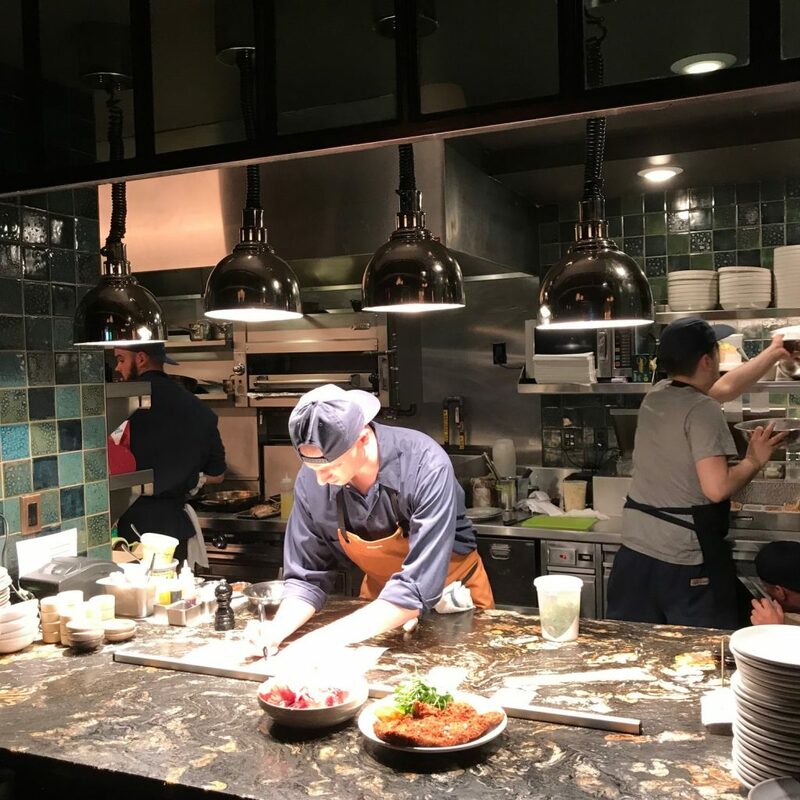 Happy Cooking Hospitality’s (Fedora, Bar Sardine, Fairfax, Jeffrey’s Grocery, Joseph Leonard, Studio), Gabe Stulman, has hit it big with his latest restaurant. 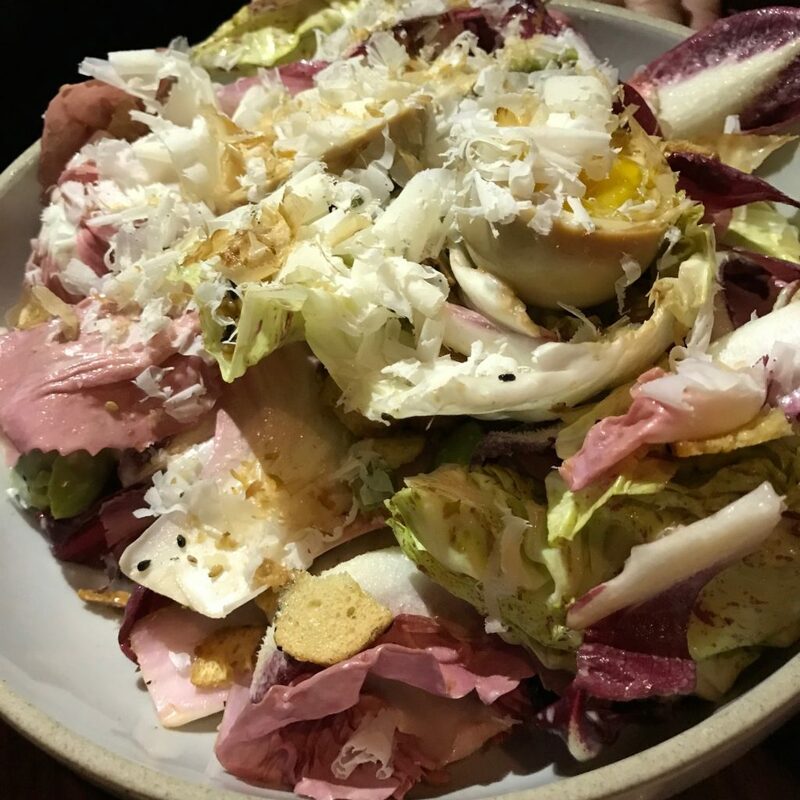 The 80-seat restaurant, designed by Roman and Williams, offers elevated American food with global inflections from executive chef Matt Griffin. Named after his son, Simon, (the baby shower was dominated by whale themed gifts), the place looks good and tastes great. The restaurant is warm and friendly as is the staff. Our server, Becky, was a total pleasure. 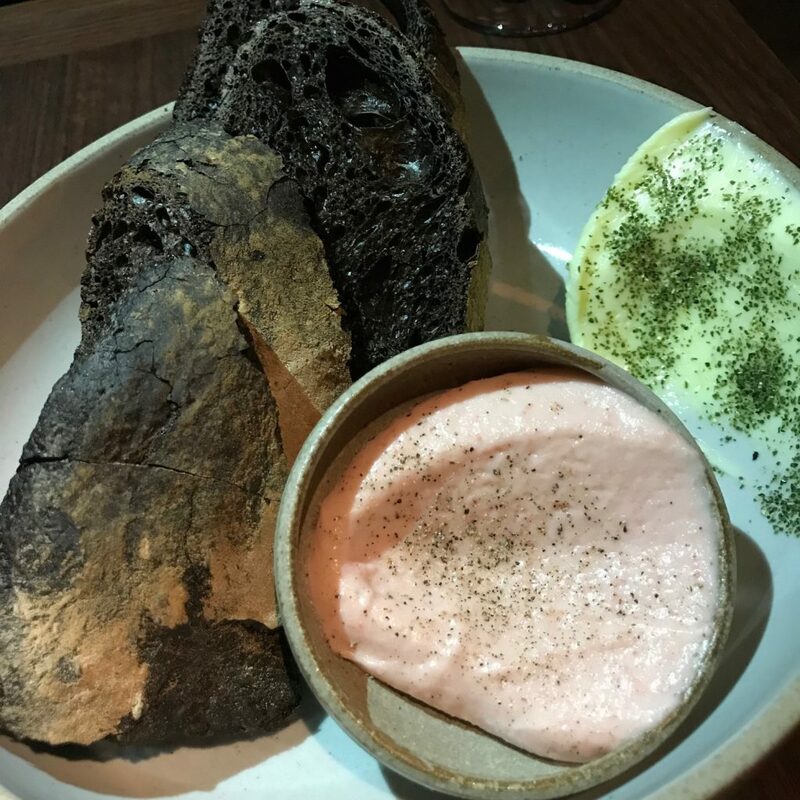 We started with amazing Black Bread with creamy Taramasalata and a french butter with Icelandic kelp that was beyond delicious ($5). 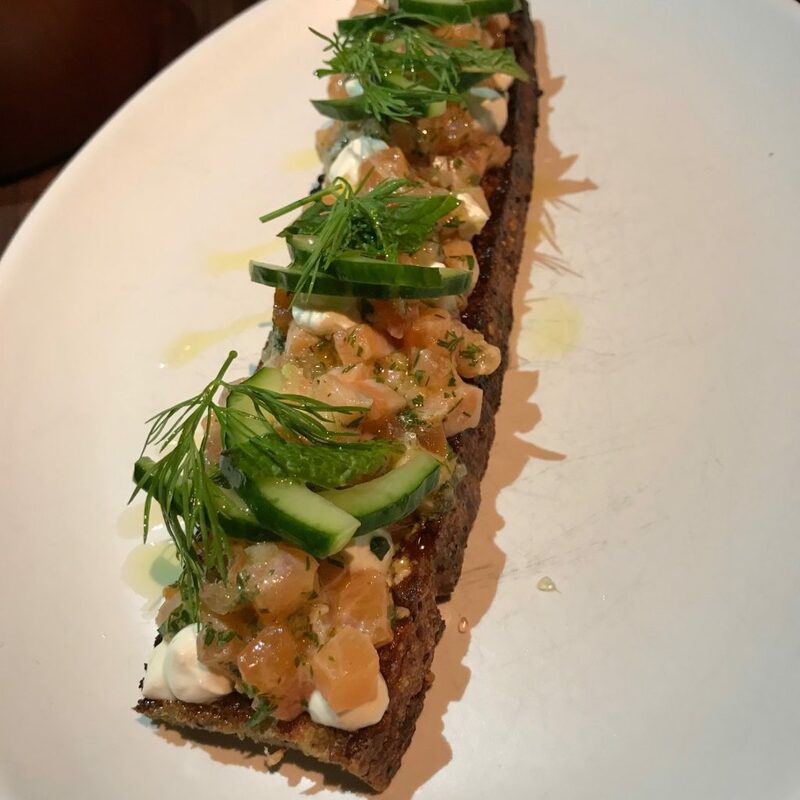 We then indulged in a superb Arctic Char Tartare with finger lime, smoked cream on multigrain toast ($16). 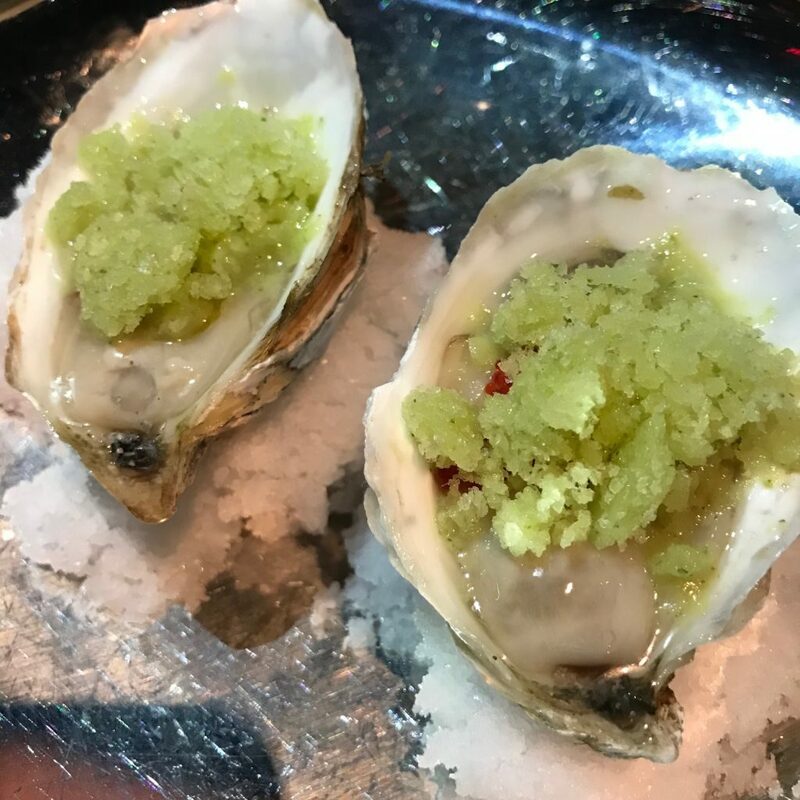 The complimentary oysters were smooth and fragrant. 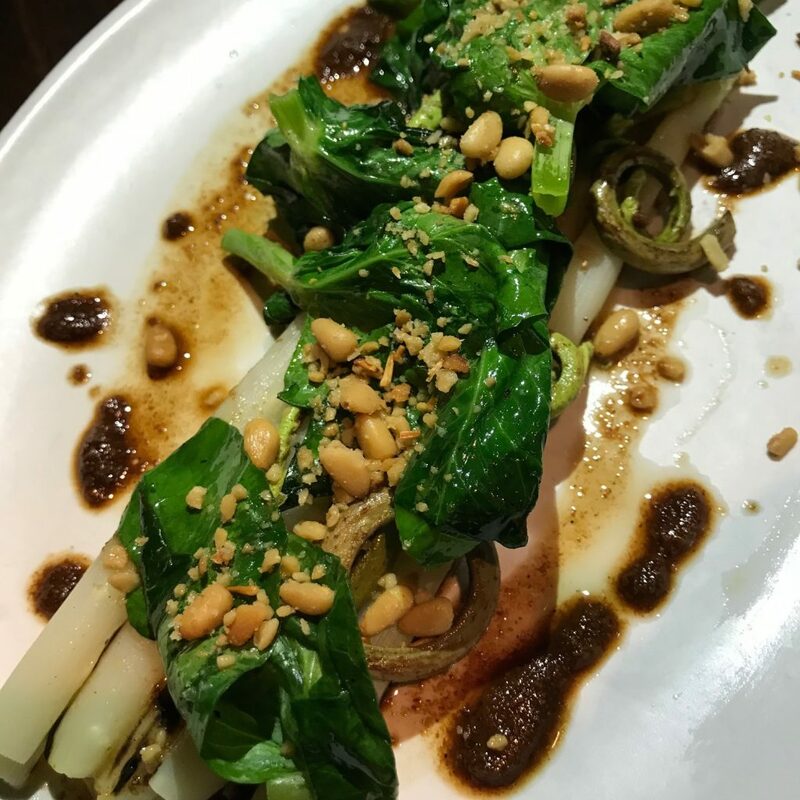 The Chicory Tonnato Salad was huge and so unusual. 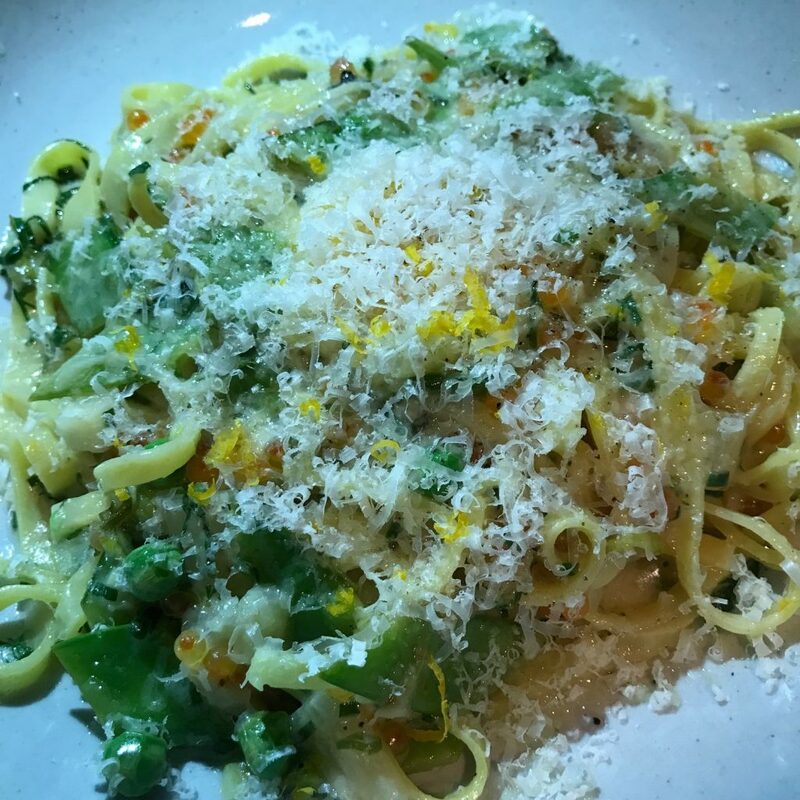 The soy cured eggs were fabulous and the parmesan highlighted all the ingredients ($17). The special Taglialini pasta with English peas, baby fennel and trout roe was heavenly ($23). 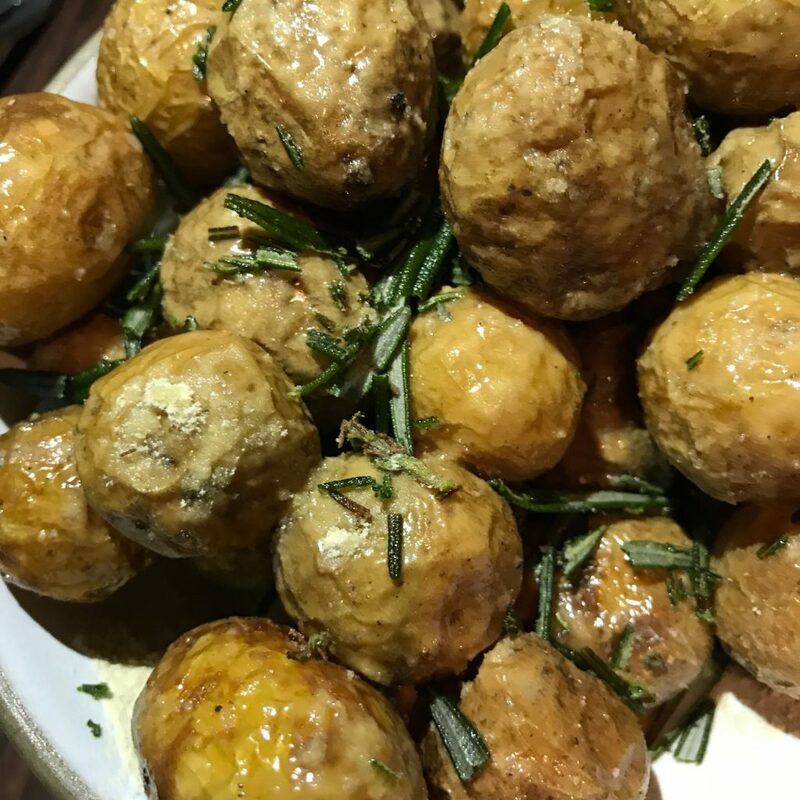 We had mulled over the Rosemary Roasted Potatoes with aioli before settling on the pasta. Becky sent us over the little nuggets of bliss just so we did not have to settle ($9). An evening special, the White Aparagus with an Asian sauce, were stellar ($16). Having a decent knowledge of Bordeaux wines, I recognized an outstanding red from the Cadillac winery. The wine was offered at a reasonable price point ($15). The desserts sounded great, but we had no room. We walked part of the way home because breathing was difficult. Gabe Stulman has singlehandedly turned the Freehand Hotel at Lexington and 23rd Street into a destination. Before dinner, we met friends (shout out to foodies Kathy and Bob) from San Francisco at Studio which I recently reviewed and then had innovative cocktails in the new George Washington Bar, all within the confines of the hotel. Treat yourself…no need to deal with a Whale of a bill at the end of the thoroughly enjoyable evening. Simon & The Whale Freehand Hotel 23 Lexington Avenue between 23rd and 24th Street. Open daily for dinner 5-11pm. Reservations on RESY.